Ever wanted to print something from your iDevice (iPhone/iPad)? This i possible through AirPrint. (Your iDevice needs to be running iOS 4.2.1 or later for AirPrint to be enabled.) Unfortunately not that may printers support AirPrint. 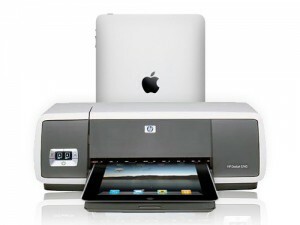 According to Apple, there are about 25 printers that support AirPrint, and they are all from HP. Now you are probably thinking “Damn, now I need to buy a new printer“. -But not necessary, you can use your Windows computer as a gateway to the printer. The only downside with this approach is that your computer needs to be turned on, before you can print from your iDevice. I assume you have your printer installed on your Windows computer, if not you will have to install that first. For this to work you need to be able to print from your Windows computer. When that is done, you will need to install “AirPrint for Windows” from Jaxov. You will find the download and complete step-by-step install guide here. When everything i setup on your Windows computer, you are ready to print from you iDevice. The print function i often hidden in the “share menu” (In Safari the menu where you add bookmarks, and in mail where you reply or forward. My printer is a Lexmark X4975 Professional, connected to my Windows 7 computer via WiFi. Printing work perfect from both my iPhone 3Gs and iPad 2. There are only 2 things that could be better, for my my setup to be perfect. First thing is that the Windows computer needs to be on for printing to work. Other thing is that I’m primarily using the 3G connection from my iPhone (because of my mobile and internet plans at my provider), and for AirPrint to work, you need to be on the same local network. This means that I have to switch on WiFi on my iPhone in order to print from that device. But both things are minor issues, that I would be able to get rid of by buying one of the HP printers with AirPrint support, and changing my plans at my provider. But I think I will stick to what i have now, those problems are not really problems. This entry was posted by Ricki Runge on June 19, 2011 at 13:24, and is filed under Apple. Follow any responses to this post through RSS 2.0.You can leave a response or trackback from your own site.